BBC Radio 5 live - Football Daily, Can Mane win Player of the Year? Can Mane win Player of the Year? 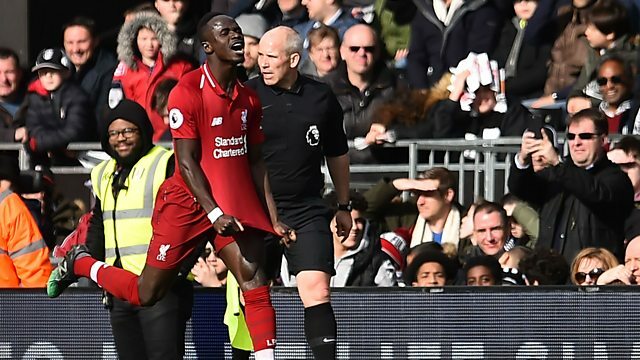 With 11 goals in the last 11 games, is Sadio Mane the most important of Liverpool's front-three? Kelly Cates is joined by Andy Townsend, Ian Wright and Chris Sutton. They speak to Brighton's striker Glenn Murray about what it means for Brighton to have reached the FA Cup semi-final. Also on the pod, what can Southampton midfielder James Ward-Prowse and Chelsea's Calum Hudson-Odoi bring to the England team? Wrighty, Townsend and Sutton describe the most impressive footballers' houses they have ever been.